In this competitive landscape, technology companies are constantly working behind the scenes to develop new and exciting ways to engage customers. In fact, they are working hard to create sites that are user-friendly, clear, innovative, and consistent with a corporate style while being adaptable to every conceivable device. Do you know what influences your website performance when it comes to user interaction? The answer is all the tiny details including the font style. A font is, in fact, is a way more significant factor that most believe, as it enables readers to consume content for an enhanced engagement. A bad font used can increase your bounce rate – which means you lose visitors, conversions, and most importantly – sales. How to choose a font for your website or blog? Selecting a font for your website is not that easy. The font should not only look simple but also offer the needed readability while being aligned with your brand. Font styles definitely have a dependency on the nature of your business. For example, the fonts used for an accounting or legal business website is not seen in a wedding photography site. Font styles can convey different messages such as trust, stability, strength, sophistication, creativity, etc. A professional-looking, progressive and modern font design uplifts user experience and increases session time. 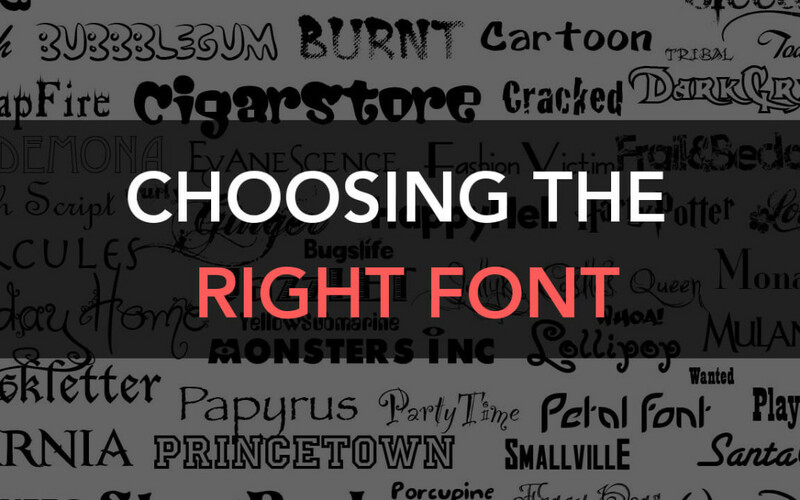 Furthermore, a correctly-chosen font design has a deeper connection and engagement with your visitors. Open Sans is widely used in the digital world because it is clean, stable, modern, universal, simple, and objective. It offers great legibility to your content. It is available in five weights with matching italics. Best-in-practice, Open Sans has been optimized for both web as well as mobile interfaces. Montserrat is a very useful typeface which is loved by many web and UI designers. This font style looks decent on short headings. With its high readability, Montserrat can be used in any designing project. Space Mono is a fixed-width type family developed for editorial use in headlines and display typography. It combines both grotesque and geometric influences. The font family is available in regular as well as bold weights with matching italics. The typographic features of Space Mono include old-style figures, superscript and subscript numerals alongside fractions, center-height, and cap-height currency symbols. Truly, an eye-catching font to grab the attention of readers! Merriweather is pleasant to read in body text on different screens. The styles in Merriweather include light, regular, italic, bold, and heavy. Merriweather offers traditional feeling despite being the modern shapes. Further, it is designed to be readable at very small sizes and thus can be a smart fit of banners, clippings, and images with text. The Playfair Display has an extra-large height and short descenders, which makes it best suited for headlines. Playfair is a transitional design and can be stylistically accompanied with Georgia for body text. The Capitals in this font are extra short and make it usable for confined spaces. Arvo is one of the most-used slab serif font families, perfect for screen and print. The Arvo family includes 4 different variations – Roman, Italic, Roman Bold, and Bold Italic. The flavor of the font is rather mixed. This font is close to satisfying all your needs for strong characters and high readability. Alegreya is a great substitute for any default serif web font. It was originally intended for literature because of its various letterform weights and high readability. The font style conveys varied rhythm which facilitates the reading of long texts. It incorporates more of a modern serif look and provides freshness to the page. The font styles are invariably used in digital designs. A slight change in the typography could potentially have a major positive impact on your website and business branding. To improve your site readability, you do not need to be a professional designer. Proper selection of font can easily communicate about your brand. You can harness this for your brand building and awareness—Keeping it simple yet influential is the rule! In some cases, you want a custom font that ties in perfectly with your branding and gives a unique stance to your entire brand identity. For that you need to connect with experienced font developers and designers who need to spend time understanding your brand, its attributes and how you want it portrayed. Clavis Technologies is a leading Software Development firm. The wide range of products offered by Clavis Technologies includes innovative software, content automation solutions, web / mobile apps, SaaS and PaaS Solutions. Our skilled graphic designers have an in-depth understanding of creative fonts and its usage for a better user experience. Choose Clavis technologies for customized web and mobile development solutions with creative graphics, designer fonts or even custom fonts that are created specifically for you!